Bay Area’s long-running graf mag, Clout, will celebrate the release of a series of snapbacks with ELM company this week, and celebrate the drop at their showroom in Northern Cali. The new caps will be released for a limited run in eight colorways and styles — including black/orange, navy/red, brown/yellow, black/turquoise, green/yellow, all black; and three different Clout logos. The companies will celebrate the release with an event at the Clout Showroom in San Jose, Calif. on Friday (March 25). It will feature special DJ sets by DJ Goldenchyld of The Bangerz and DJ Venom347 of Funk Lab. Food will be offered by MoGo BBQ. It goes down from 5 – 9 p.m., at: Cannery Park, 401 East Taylor Street, Suite 160, San Jose, CA 95112. See the release flier here. 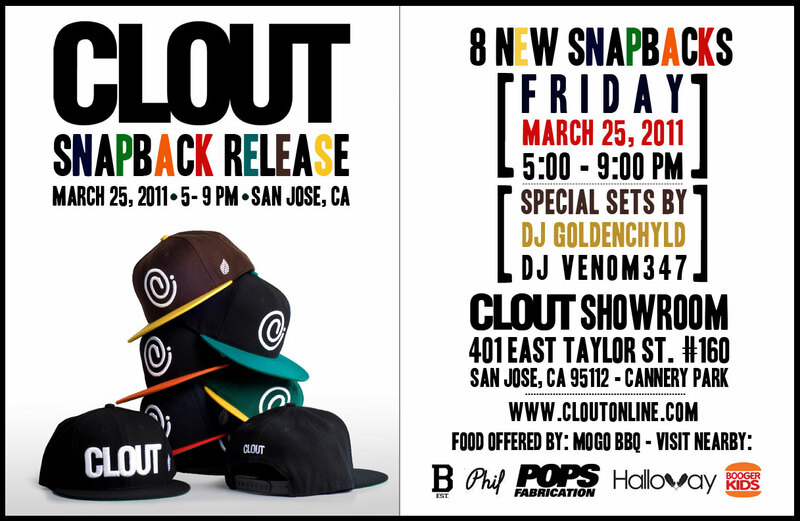 For those not able to attend the release event in San Jose, Clout will be dropping the snapbacks online on Friday a well at Shop.CloutOnline.com.